The clocks turned back last weekend, so it is darker earlier these days. So when Homebase recently offered for me to choose some new lighting to help illuminate my home during the winter months, i jumped at the chance. Good lighting, whether it's candles or electric, really does create atmosphere and cosiness and I'm really pleased with the two choices I made from their Habitat range. Firstly, for our bedroom I chose this bright orange lamp. I am really loving orange at the minute, especially this bright, eye popping shade. As our bedroom is mainly pale, subtle colours I love how this lamp has now added a splash of colour, which brightens up quite a dark corner even during the day. 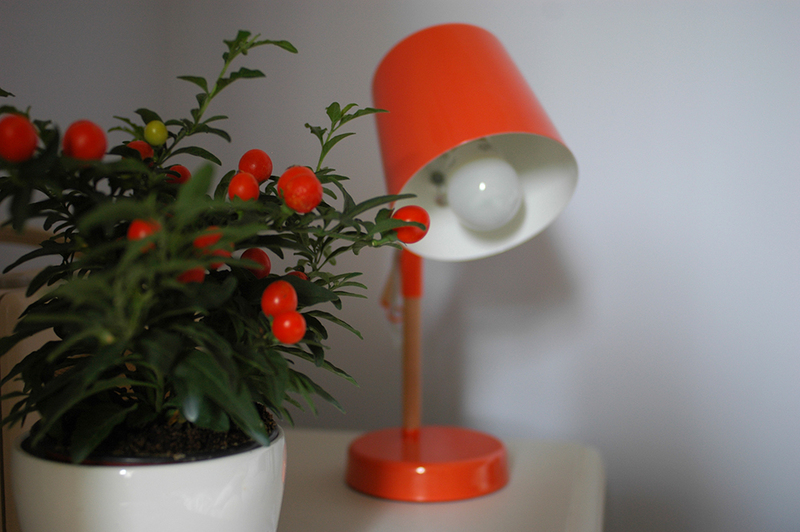 The colour of the lamp reminded me of the berries on a Solanum plant (also known as Christmas Cherry - perfect for this time of year) so I picked up one of these while in Homebase also, and I think they look lovely together. Here it is switched on - the perfect little bedside reading light! My other choice was the Helena flower lamp. This light has been around for about 10 years, designed by Helena Christensen for Habitat, and it's one I've always admired, and I thought it would work really well as a feature in our new kitchen/dining area. I love how you can bend the 'stem' of the flower around into a shape you like, and how it looks like it is 'growing' out from behind the sideboard! It almost echos the shapes of the real flowers at the other end of the sideboard, and the copper flower adds a flash of metallic colour. With a lovely orange-y glow it creates a lovely atmosphere in this corner of the room in the evening... it's definitely a piece I can see me owning for years and years to come and moving it around as our home (or future homes!) evolve. Thanks so much to Homebase for these lovely items!